Teresa (Homepage) wrote: Love the composition and I love minimalism! Well done! Asgardr (Homepage) wrote: Nice fine art abstract! I digg stuff like this! Wendy (Homepage) wrote: Love this photo. Makes you think. I never thought to photograph just water. It's more beautiful than you would think. Nice composition. Stephen (Homepage) wrote: really nice. I love the negative space. NJ & SB Photography (Homepage) wrote: Bella y relajante captura, excelente exposición,la belleza del mar al máximo!! 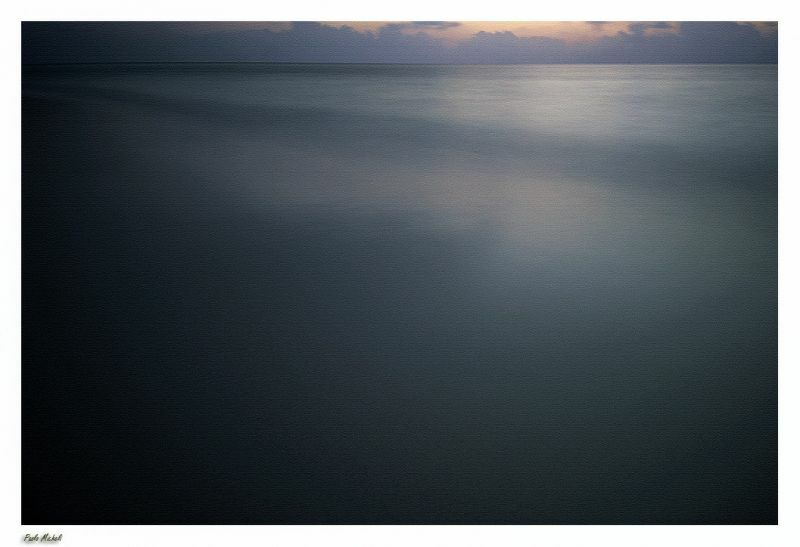 gavin hart (Homepage) wrote: So serene and such subtle tonal variations on the sea. Marcie (Homepage) wrote: Stunning abstract. The water has an almost velvety smooth texture. Beautiful! Terry H. (Homepage) wrote: Simple, beautiful, creative. Great! Photographe.ma (Homepage) wrote: Hello, I love this photo, it can be titled "Cerenity" Very nice colors & lighting. Arjan - PlasticDaisy (Homepage) wrote: Good choice to put the horizon so high in this frame! Lighting is gorgeous! Sidney (Homepage) wrote: Wow! Excellent ! Mike Paulison (Homepage) wrote: Wow. That water is smooth to forever! Beautiful shot! beanow (Homepage) wrote: Wonderful, elegant captur. Super! Krims@nline.be (Homepage) wrote: Wonderfull moody and inimalistic capture, excellent work Paolo. Claus Petersen (Homepage) wrote: Beautiful minimalism, and fantastic dark mood! this is like an abyss just waiting to swallow you!